I am going to detail some of the bigger Better Homes and Gardens outdoor furniture collections. I will give you the sets and individual pieces that are available for each set. Hopefully you will find this information helpful to properly select your furniture for your outdoor room. I will break down the materials, colors and how much space you are going to need to make these sets work. Now lets get started. Most modern outdoor wicker furniture is made from a aluminum frame and a resin wicker cover. The resin wicker can be molded into many colors. The color will not fade because it is not painted on like the rattan wicker. This is a very durable material and will take very little care to maintain in like new condition. There are two types of metal sets in this article. The steel mesh set has a black powder coated frames. I have had several of these sets and they do last quite a long time without much care. I have not had any rust problems with any of my sets. The aluminum framed sets also have a powder coated will be lighter than the same frame in steel. Cushions and pillows are made to be outside, they are mildew resistant, stain resistant and UV protected. I do not leave my cushions or pillows outside for long periods of time, as the weather will still get to them. Cushions for these sets are made from an Olefin fabric and polyester stuffing. Pillows are filled with a polyester material. 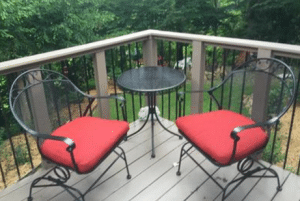 Most balconies or small patios are 6 or 8 foot square. Bistro sets, love seats or chairs with small tables (called Chat Sets) will work for these small spaces. Too much furniture will have your space crowded and you will not enjoy it. When you move to this larger area you can include small sitting sets, loungers, gliders for sitting or a small dining set for eating. Gas fire pits can be a great center piece for you outdoor area and can be used on decks made from any material unlike the wood burning fire pits. Knowing what your are going to use your area for will guide you to the correct type of outdoor furniture for you, with this size of space you will not have room for both types conversation and dining, you will have to choose one or the other. If you have a larger area, over 12 foot by 12 foot, you can put in a larger sitting set or a combination of sitting and dining. Having a dining space and separate sitting area can be divided by having an area rug in the sitting area. Larger conversation sets with a sectional set and chairs will work also. One set even has a day bed for your outdoor space. Having a conversation, dining and sleeping area in your outdoor space will take a large area. Some of these sets will be available a your local Walmart store. For complete sets you can look online and have it sent to your local store for free. Having any of these items sent to your home will involve shipping fees, this may be the best option for those without pickup trucks or a trailer to haul the large boxes. Returns for all sales can be made to a local store no matter how you purchased these items. Trying to decide what type of furniture that you will get for your outdoor space, your first thing to look at is the size of your space. The look that you want will be your choice. Mixing some styles will work also. Wicker or metal can work together in larger spaces. Some of these sets will come in more than one color. 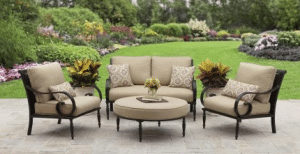 The Azalea Ridge Wicker set will come in white or dark brown. Cushion color can be changed to make the set have a new feel. The use of your outdoor space will be the guide for your selection of furniture. Unless you always eat on the couch inside, you are not going to eat on the couch outside. Having a small area you may get a set of lounging chairs with a table for a duel purpose area. Covers will help you protect your investment. Poly covers are available for most pieces of outdoor furniture. Having someplace to store you cushions and pillows when not in use will prolong their life. A small storage cabinet or a piece of furniture with storage will work in larger areas. These sets can be cleaned with just soap and water. Do not use any harsh chemicals to clean any outdoor furniture as it will harm your finish. Made with an aluminum frame wrapped with a resin wicker in white or dark brown. Cushion colors can also be chosen in the brown set. Sets are available in 3 piece low bistro or high bistro sets, 4 piece conversation set or 5 piece dining sets. You can add individual pieces such as a chaise lounger, side table, rocking chair, glider that seats two, three seat sofa, swing that hangs with chains, small side table, ottoman with storage or stand alone swing with canopy. As you can see this style will allow you to mix and match furniture for any outdoor space. For more information on this collection look at my article here. This set will have a dark brown powder coated steel and aluminum frame. Cushions are available in tan. Both dining and conversation sets are available. Seating can be a sectional sofa set that seats 7, conversation set that seats 5 or a chat set that seats 2. Dining sets start with a bistro set up to a full dining set that seats 6 people. Individual pieces are a chaise lounge, love seat, serving cart and a 57 inch gas fire pit for more information on the gas fire pit see my article here. Combining any of these pieces will make any outdoor living space a great place for your guest to gather. For more information on this collection look at my article here. The Providence collection has a brown powder coated aluminum frame covered with a brown resin wicker weave. Tan cushion will come with all seating items. Items in sets include a dining set that seats 6 and a conversation set that seats 4. 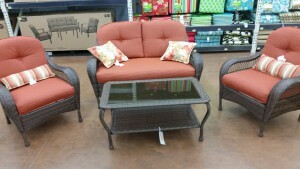 Extra items that go with the sets are a chaise lounge, outdoor day bed, recliner and a 2 seat glider. If you are looking for the long lasting wicker set for a medium sized space, these collection will work well. The powder coated black aluminum frame is very sturdy. The tan cushions will look good in your outdoor space. Bistro dining set will seat two and the conversation set will seat four with a round ottoman that could be used for extra seating. A chaise lounge is available for extra seating. Although not as many extra different pieces are available in this collection, it will work well in most medium to large outdoor areas. The black powder coated steel frame will be very durable in any outdoor setting. Cushions are available in a green or red color. This collection is for the smaller outdoor spaces. Dining sets come with motion chairs and are available with 2 or 4 seats. The four piece conversation set will seat four. A chaise lounge with wheels and a 2 seat glider are extra pieces for this collection. This set will work great for balconies, small decks or patios. It will look great in a smaller space. See more information on this collection here. 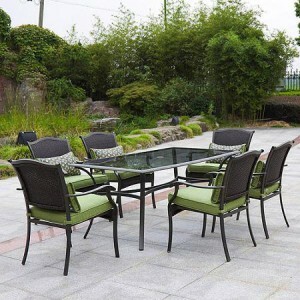 I have given you the major collections in the Better Homes and Gardens outdoor furniture line. Each collection will work in different size outdoor spaces. You will have to choose what will work best for you, I have given you the basic details. If you need further details of any of these sets or pieces, follow the links provided for my other post. Thanks for reading, if you have any question, comments or would like any further information please use the forms below. If you found this information helpful, pass it on with your social links to your friends. I’ve been really impressed with the new style wicker furniture. When I first handled one of the chairs at a local hardware store I was impressed with the heft of the unit. I have a medium size patio so I’m particularly interested in furniture that fits the space. The look of the Providence line fits in with my patio. Great review of some really nice looking outdoor furniture sets. I can’t wait for spring! 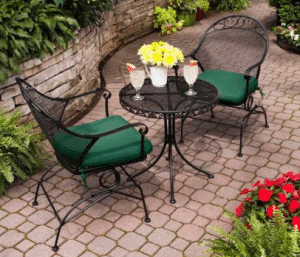 Britt, The Providence Collection is a good choice for a medium sized outdoor space. I like the fact that there are a lot of additional items for this set that you can add later. Thanks for a brilliant look at outdoor furniture, this is the time of year that i start to think about my outdoor space and what will i need come the spring. This year i need new outdoor furniture, and your article has helped me narrow down one i like, i found your article very interesting and informative for out door living. I have narrowed down my choice to the Englewood Heights out door furniture. Do you know if that is the only colour the furniture comes in? At this time the Englewood Heights only comes in the color shown. You can change some of the color with replacement cushions to match your outdoor decor. The hard part is if you want the round ottoman you will have to recover or have someone make one to match the size, not too easy. The other way to change the look is to add some color in accessry pillows and throws, mayby a brighter color than the drab light blue. Also something to look at is an outside area rug that will change the look. Your site is amazing. I live way out in the country on 10 acres. What solor light system would be best for a pathway leading from the driveway to my home? Depends on the look that you are after, how far apart do you need the fixtures and low light vs bright light. Bollards will look great and will give a good lighting if placed within 4 to 6 feet apart. If you have some shading from trees or bushes this will effect the amount of light your fixtures will give out after dark. Look at some of the details that I have given in this category here.